The trouble with striving to look on the bright side of things is that it's pretty darn hard these days, to tell the truth, to find the bright side of anything. For what we're all being forced to bear witness to is an extraordinary and extraordinarily blood-curdling sight: the enormously endearing and widely presumed eternal Goldilocks economy is, right before our startled eyes, metamorphosing into the Humpty Dumpty economy. 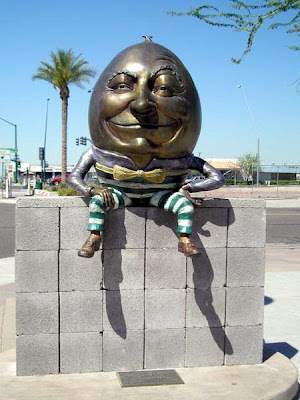 The wrenching changes being wrought by a falling Humpty Dumpty economy, largely created by credit, and a swooning stock market, kited by leverage, are everywhere evident. Housing foreclosures swirled up to an all-time high of 0.83% of all mortgages nationwide. Over 5.8% of homeowners were behind in their mortgage payments, the largest number in upwards of two decades. House prices lost a staggering 8.9% in 2007 as a whole (and they're still tumbling). Yet, despite the ubiquitous plunge in prices, the supply of unsold houses rose to four million, or to over 10 months' worth. Homeowners' equity fell below 50% for the first time since 1945, hitting a new low of 47.9%. As Barry Ritholtz nicely put it, never before have banks and the other various and sundry lenders owned more of the average American's house than he or she does. Speaking of lenders, thrifts and savings outfits lost a cool $5.24 billion in the final quarter of '07, as they diligently wrote down tons of goodwill (perhaps it should more properly be called ill will). In January, to continue this lugubrious litany of the damage done in the Humpty Dumpty economy and the ravages wrought by the bear market, the equity portfolios of the largest U.S pension plans, according to the calculations of Mercer, which keeps tabs on such things, shrunk by $110 billion. Not exactly chump change, even when it's other peoples' money. The credit crunch, as has been deservedly publicized, has begun to punch a few holes in the great private-equity bubble and a scattering (so far) of hedge funds have been badly wounded, several fatally. It's almost as if all its tributaries flooded the river Styx, causing its fetid and noxious waters to spill far and wide over its banks. And what it all spells in bold-face letters, of course, is recession. But as Jay and David Levy, father and son proprietors of the famed Jerome Levy Forecasting Center, contend in their latest commentary, this is a much different animal than the tame and docile recessions we've grown accustomed to. Never, they point out, "have such broad and severe credit-quality problems preceded a recession. Recessions cause burgeoning financial problems to intensify, not recede. Credit problems lag the business cycle, not the other way around." "NEVER ASK THE BARBER IF YOU NEED A HAIRCUT. Never ask the Realtor if the house you are considering buying is a bargain at the price offered. And never ask the government to calculate the rate of inflation when it can save millions of dollars in cost-of-living adjustments." Those tidbits of wisdom come from Ray DeVoe, who authors the eponymous DeVoe Report. We've known Ray for a bunch of years and read with pleasure his weekly observations on the market, the economy and life in general. A shrewd and, even rarer, sane investment type, he does his business under the Jesup & Lamont flag. What makes the quote above especially pertinent, obviously, is that even while recession's clammy hand makes itself felt, inflationary fires are starting to flare in earnest, stirring unfond memories of the 1970s and early 1980s, when the cost of virtually everything from diamonds to doughnuts vaulted into the wild blue yonder. Ray takes due note of the double whammy of recession and inflation back then and points out that the measures of both used at the time were a heap more accurate than those Uncle Sam relies on today. Especially notable, we think, was the calculation he cites of January's 4.3% rise in the consumer-price index (vs. January 2006) by John Williams of Shadow Government Statistics. Using the degimmicked yardstick that was in use prior to 1980, Williams comes up with a reading of 11.8%, which, to these tired eyes, seems a quantum leap up from the official 4.3%. And, more to the point, it squares a lot more closely with $106-a-barrel crude, not to mention upward leaps just this year of commodities of every kind from 30% or more in aluminum, oats and silver and double-digit gains in coffee, corn, wheat and zinc, among others. In contrast to the consensus expectations of 25,000 additional jobs, payrolls shrunk by a tidy 63,000 and that doesn't quite tell the whole dreary story. The private sector lost 101,000 jobs. So only by grace of hiring by the federal and local governments was the loss shaved. What's more, our old bugaboo, the birth/death concoction, supposedly chipped in 135,000 jobs. We'll be generous and assume that half of those 135,000 mythical additions were real; anything more than that, though, isn't being generous; it's being downright silly. Manufacturing took it on the chin, shedding 52,000 jobs. Construction was down 39,000. Those old reliables restaurants and health care tacked on 19,000 and 37,000 new slots, respectively. As Philippa Dunne and Doug Henwood of the Liscio Report note, something like 75% of the employment gains over the past year have been in health care and restaurants. Neither category typically abounds with exceptionally high pay and, we have a hunch, the eateries particularly are going to be painfully pinched by rising costs and declining patronage. The unemployment rate ticked down, but that, alas, was due to a sharp contraction of the labor force. While Philippa and Doug make a reasonable argument that this may not wholly reflect would-be workers opting out because they can't find a job, we're not so sure. In those circumstances, psyches are tough to plumb. An easier call is that Friday's dismal job report cinches it: We're in a recession.